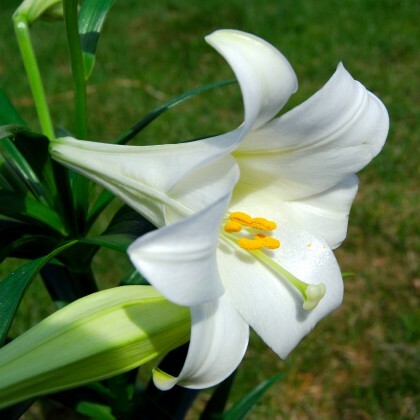 There are many different species of plants called “lily”: Easter lily, day lily, Asiatic lily, tiger lily, peace lily, calla lily, and lily of the valley, among others. And though they may be beautiful to look at, a cat could die of kidney failure if he should eat any part of these toxic species and not receive treatment immediately. In fact, as little as two leaves can make your cat sick, and if left untreated, can become fatal in as little as three days. When determining if a lily plant you want or have is toxic, always look at the scientific name of the plant. The scientific name is a two-part name: the “first name,” which is capitalized, is the genus; the “second name” is the species, and it is not capitalized. You may see additional names following the first and second; these are subdivisions of the species and are not important for determining toxicity. The second name is sometimes abbreviated sp. or spp. This means that the actual species has not been identified. Sometimes the first name is abbreviated, usually with just the first letter of the name. This is usually done when there is a list of several species from the same genus. The lily plants of greatest concern are any from the genus Lilium (Lilium sp. ), which includes Easter lilies, tiger lilies, and Asiatic lilies, and any from the genus Hemerocallis (Hemerocallis sp. ), which includes day lilies. If your cat has recently eaten a lily and has not vomited, call your veterinarian to see if you should induce vomiting before bringing her to an animal hospital. Call the nearest animal hospital or the Pet Poison Helpline at 1-855-213-6680. The sooner she gets treatment, the better her chances are for survival. And if you can, bring a piece of the lily plant to the hospital. Finding a chewed-on lily plant or pieces of plant in the vomit allows for a definitive diagnosis. Because the toxic principle in lilies attacks the kidneys, blood and urine tests will be taken to evaluate kidney function. If your cat has only recently ingested the plant material and has still not vomited, your veterinarian will try to induce vomiting. Activated charcoal will be given orally to absorb any toxin that might remain in the gut. The key to survival is high volumes of fluids given intravenously (IV) to try and prevent dehydration and the kidneys shutting down. The fluids will be given for 1 to 2 days, while monitoring your cat’s kidneys as well as urine output. Lack of urine production is a sign that the treatment was unsuccessful. Calla or arum lilies (Zantedeschia aethiopica) and peace lilies (Spathiphyllum sp.) contain crystals that are extremely irritating to the mouth and digestive tract, causing drooling, vomiting, and diarrhea; however, they do not affect the kidneys. Lily of the valley (Convalaria majalis) affects the heart, causing irregular heartbeat and low blood pressure, and can progress to seizures or coma. If treatment is successful, there are no reported long-term consequences. Monitor your cat for changes in his urination habits, especially frequency of urination. If at all possible, do not have lilies in your house, not even as cut flowers. If you do have lilies in the house, make sure your cat cannot reach them and inform everyone in your household of the dangers lilies pose to the cat. Cats are less likely to chew on lilies in your yard, especially if there are more appealing things to chew on, like grass and catnip; however, it is best not to have any lilies in your yard. This entry was posted in News by Scott Schini. Bookmark the permalink.